Emily was so excited when she heard that Yo Gabba Gabba was going on tour again. She hoped that they would make a trip to our area. She was glued to the computer on announcement day. They had balloons covering a map of the United States. Every minute they would release a balloon until the cities remained were the ones that the tour was coming too. Lo and behold, St. Louis was one of them! We decided that we would get tickets. It would be a fun “Emily, Mommy and Daddy” bonding experience. The first major thing since Zachary was born. And it would be her first live show. Emily’s cousin, Chloe, is also into Yo Gabba Gabba. We got tickets for her and her mommy and daddy as well. It was going to be Chloe’s first big outing with her parents since the birth of her baby brother too. Emily and Chloe are a trip. They are almost exactly a year apart but almost the same size. That’s saying something about Chloe since Emily is the size of a small 5 year old! They have so much fun when they get together. I was looking forward to seeing the two of them having a good time together. The show was this past Sunday. Emily was almost as excited to see the show as she was to see her cousin! It was SO much fun! I think all of the adults had as much fun as the kids! I know some people can’t stand the show but we like it. Sure, the characters are a little out there. And the man with a fuzzy orange hat wearing an orange jumpsuit???? But, the show has a lesson in every episode. It is full of great music and never ceases to make you laugh. The live show was similar to an actual show. The did a diddy with each character and some of the same segments that are on the show. Super music friends show with the Aquabats, dancy dance time and Biz’s Beat of the Day. There was tons of dancing and interacting. It was so much fun to see Emily and Chloe standing and rocking to the music. It’s kind of sad that I knew the words to almost every song! Emily loved when the dropped balloons from the ceiling, shot confetti from the front and blew bubbles into the crowd. I ended up coming home with pockets full of streamers and confetti. I think I finally got it all into the trash after about 4 days! We celebrated by wearing our green and eating our corned beef! Emily and I also made green potatoes. (Mashed potatoes mixed with spinach) Surprisingly, Emily LOVED the corned beef. She is really starting to branch out. I am so proud! 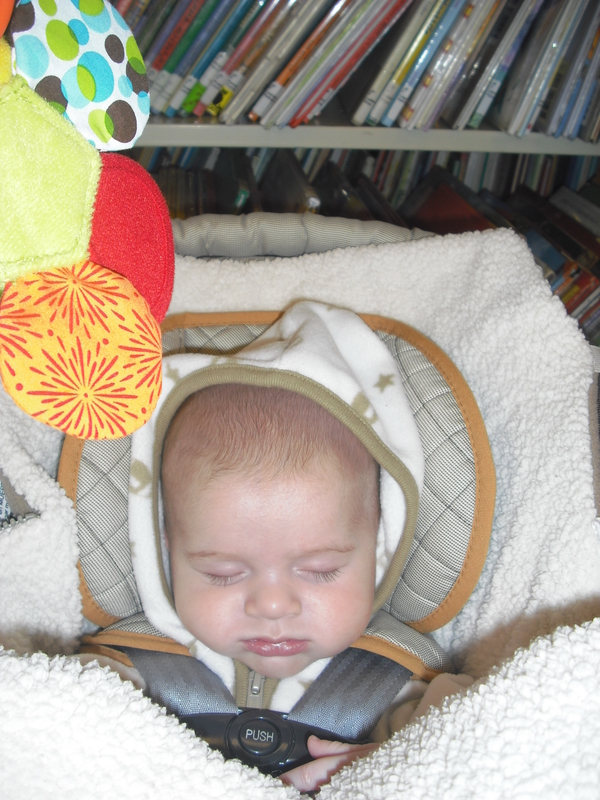 Zachary went to the library for the first time. I am hoping that he has the same love of books that his sister does. She has been a book lover from way back. Before Zachary arrived, we went to the library every single week. We walked out with 8-12 books and ended up reading each one of those about 4 or more times each. Emily and I thought we would get Zachary hooked on books early. I am not sure he was too enthused! 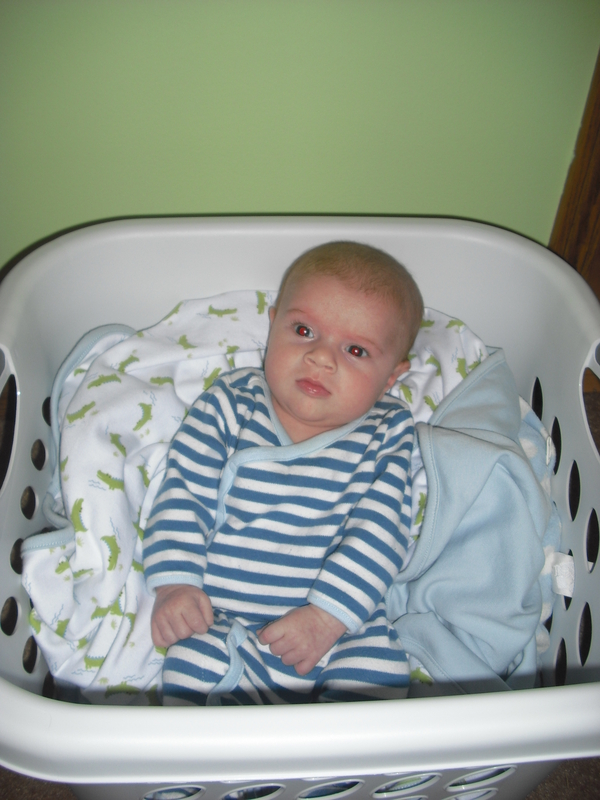 Cutest basket of laundry I have ever seen! It’s hard to believe that it has been two short months since Zachary has entered our lives. He has grown and changed so much in the past 8 weeks. He is such a joy in our lives and I can hardly remember what our lives were like without him. In the past month he has attended his first birthday party (Daddy’s), experienced his first restaurant (Red Robin), taken his first walk, been to the park and hit some stores. 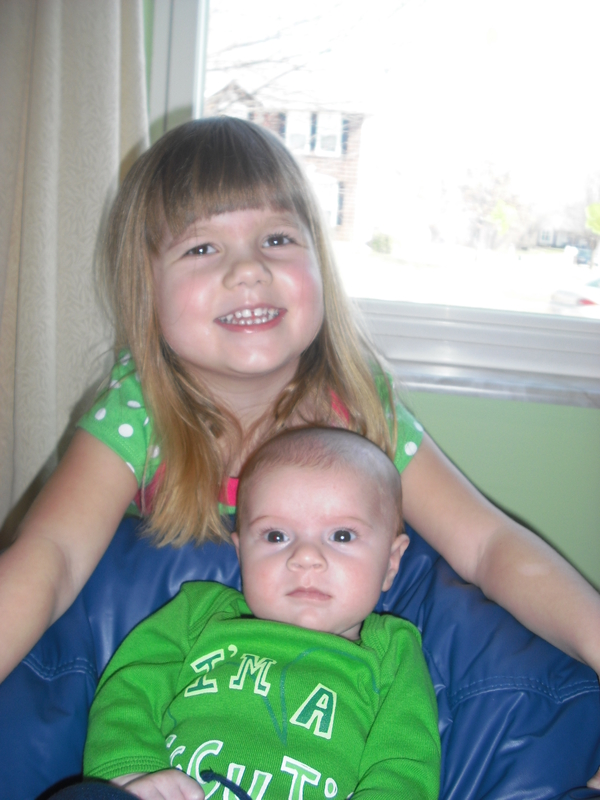 He even went with his big sister to get her hair cut. A man on the move. He took his two month doctor visit in stride. Except for the part when I left him with the nurses so I could take Emily to the bathroom. He ended up with two shots and an oral vaccine. Poor little guy was so mad at me after he got his shots. In my eyes, he looked at me like I had let him down. He got lots of snuggles and love after the mean nurses left. He’s growing, just not so fast. 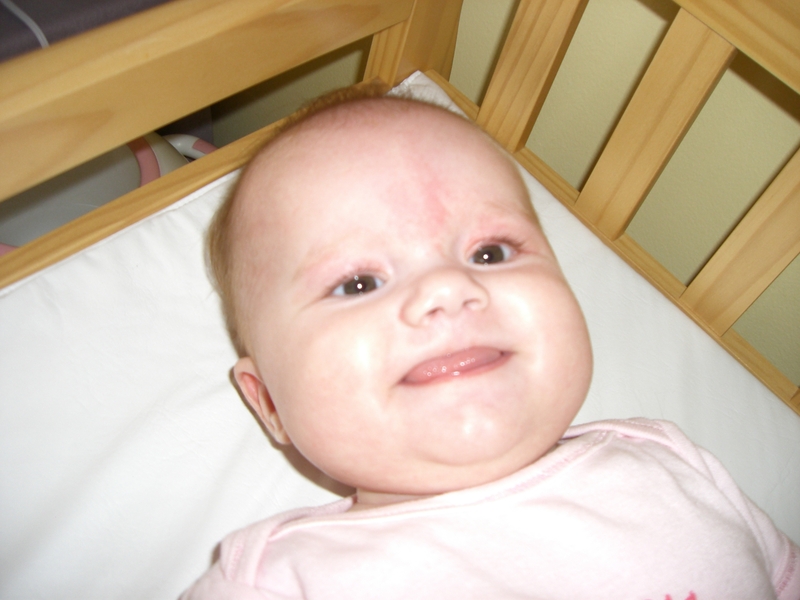 We are dealing with issues of reflux, which we originally thought was colic. Little man is so young to be on medicine already but he is taking Zantac to help with the reflux as well as some mylanta. We have had to start putting rice cereal in his bottle to help thicken the formula so it stays down. I read somewhere that reflux usually peaks around 4 months so hopefully he’ll turn the corner soon. After every feeding he has to remain in an upright position for at least a half hour. Not a big deal except the late feedings. Then we all get a little tired. I read somewhere that reflux usually peaks around 4 months so hopefully he’ll turn the corner soon. 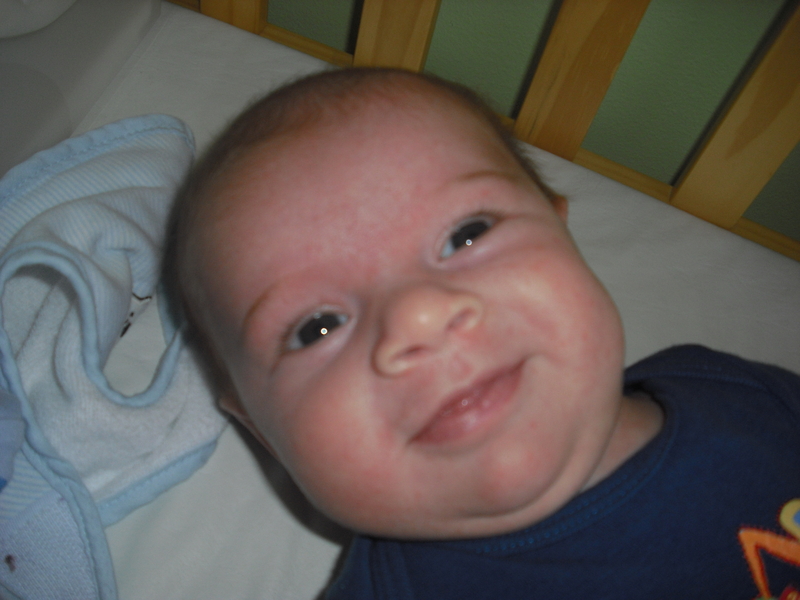 Despite the reflux, Zachary is a happy little guy. You can tell the medication is helping just by looking at him. He is more social and active. He smiles all the time. He loves playing on his playmat and will “talk” to the animals and to us. Zachary is starting to love baths more and more. He is getting a little better at tummy time when he is able to have it. He will push himself up for a bit before he gets mad and starts to scream. Right now he can’t have tummy time within two hours after feedings so it’s hard to get it in all the time because he wants to sleep by that point. He is a strong little guy with a spunky personality already. 2 months down and loving every minute of it! Think there is any family resemblance? Even at this age difference, I think there is no way they can deny being siblings!